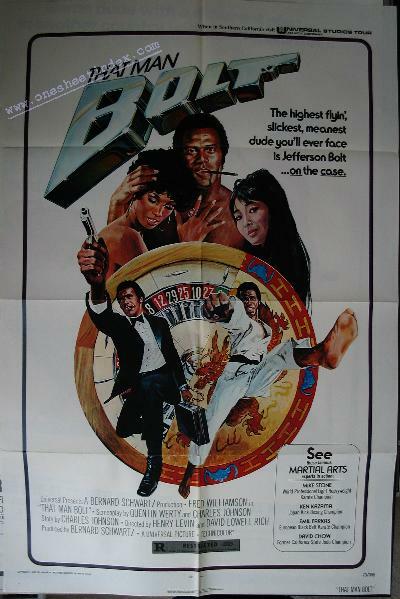 Jefferson Lincoln Bolt (FRED WILLIAMSON), black, ruggedly handsome, highly intelligent, bon vivant (by choice), a courier by trade, and skilled in the martial arts, must deliver an attache case containing one million dollars from a bank in Hong Kong to Mexico City via Los Angeles. He is met at the airport in Los Angeles by a group headed by Raoul DeVargas (VASSILI LAMBRINOS), who plan to take the money on the spot. Bolt disposes of his assailants, takes their limousine, and heads for his residence, which is staked out. A car chase ensues. On the verge of being overtaken, Bolt drives the limousine under a truck trailer shearing off the top of the car; he keeps going completely foiling the chasers. Noting that the limo came from Las Vegas, Bolt changes his itinerary and goes there. singer who elects to share the rest of Bolt's evening. While the two are deeply engrossed in each other, a hit man takes a shot at Bolt and Sam catches the bullet. Bolt spins out of the bed with lightning speed and lets fly with a shuriken, impaling it in the attacker. Infuriated and deeply bothered by Sam's death, Bolt returns to the bank in Hong Kong. A tail picks him up. There in the oriental metropolis, as he moves from clue to clue in checking Out the money, obstacles line his way. Using the martial arts with agility, he eventually gets to the mastermind behind the operation, a Chinese merchant and ship owner named Kumada (SATOSHI NAKAMURA). With the unwitting assistance of Kumada's girl friend (MIKO MAYAMA), Kumada is killed and Bolt is left with the money intact - - and all his. Director of Photography ........... GERALD PERRY FINNERMAN, A. S. C.
Sound .......................... MELVIN M. METCALFE, SR.